There has been a notable shift in the discourse on drones. What was once a conversation monopolized by talks of counterterrorist strategies and bombings in Iraq and Afghanistan, it has now been revitalized to include game-changing civilian applications. People are realizing that drones are not just weapons of war. They are now being used by various industries in collecting large amounts of data to make better and more insightful business decisions. In certain places, they are even at the forefront of emergency response. In this article, we take a look at the data made available by Google Trends. They report a normalized interest index scored from 0 to 100, where 100 is given to the instance of the highest search volume. Google Trends does not provide data on absolute search volume. It is important to note that there is a pitfall in checking the data for a search term like “drone” because it may report unrelated searches, for example search results from the Australian band “The Drones” could be counted. To avoid this, a search topic was selected instead and this was “Unmanned Aerial Vehicles.” This topic the aggregate of all search queries related to it. 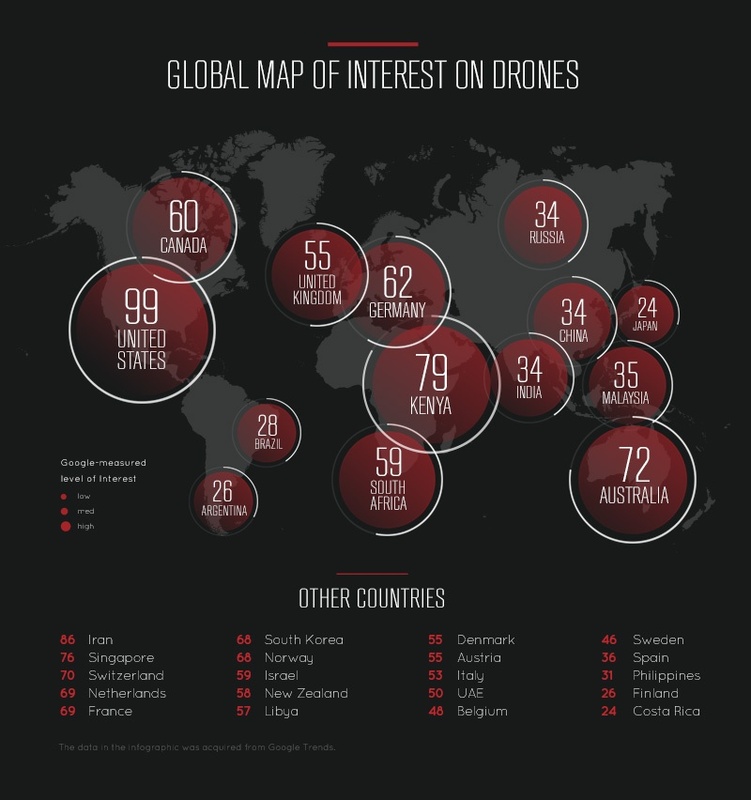 Among which, the search terms “drone” and “uav” were the most prominent. With all that established, let us now dive into the data. 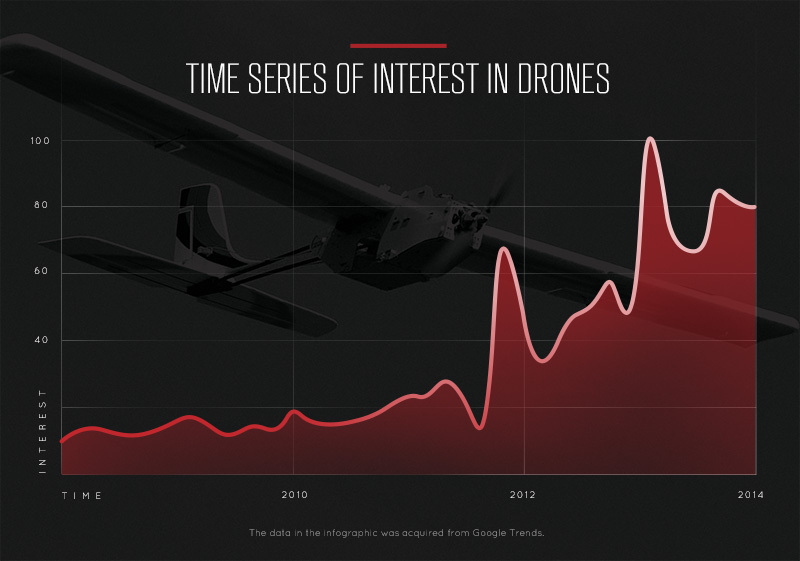 One of the most obvious insights that can immediately be drawn is that public interest in drones has increased dramatically in the past four years and this is visualized in the time series. For 2004 to 2010, search queries about drones were relatively constant, having only small fluctuations here and there. The highest increase in interest during this period occurred only when pertinent events unfolded such as when some US drones were hacked in December 2009. The increase in interest from these events, however, are small when compared to the peaks reached in the 2011 to 2014 period. In comparing search volume across countries, although the US would come as a close second, it was Pakistan that registered the highest number of queries related to UAVs. This comes as no surprise as the country has had numerous encounters with drones of the military kind, with 369 recorded attacks from 2004 to 2013. In terms of UAV-related search volume coming from cities, Washington and Los Angeles top the list. Interestingly, none of the cities in which accredited UAV testing sites are located registered significant search volume. The first huge increase in UAV-related searches occurred in December 2011 concurrent to when the US military introduced their 1.8 Gigapixel surveillance drone that was to fly over Afghanistan. This was the last time, however, that the search trend would be governed by a military issue. The biggest splash, however, would come only recently on December 2013 when Amazon founder Jeff Bezos announced that the company has begun development of their delivery drones. The internet was in an uproar and this registered the highest number of drone-related search queries thus far. After that announcement, interest grew again in March 2014 when the FAA reinforced its ban on commercial drones by fining a drone pilot but this would eventually be rescinded by a federal judge arguing that the ban was not formed through a formal rule making process. Both the growing interest in drones and the shifting discussion show the growing openness to the commercial drone industry and to drone technology in general. However, a recent Rasmussen report notes that only 26% of the public holds a positive opinion towards drones. 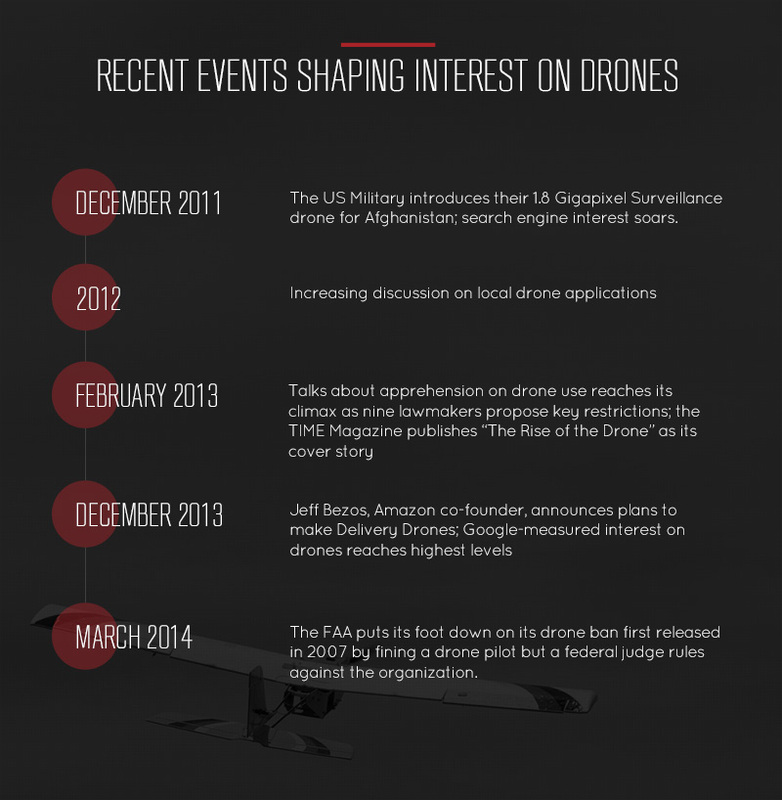 For too long, drones have been associated with military bombings. To add to this, the Snowden leaks of 2013 has heightened the public’s paranoia over the possibility of intrusions to privacy and illicit data collection. The challenge on the industry is to demonstrate how drones can be invaluable tools to assuage these apprehensions. It also rests on the FAA to provide equitable guidelines for commercial drones, one that would be fair for both the drone companies and the citizens.